I must make it a point to take pictures of the coffee shops I go to because my memory failed me easily. Now, I cannot remember the name of this coffee shop where I ate Hakka pork and drunken chicken wantan mee. The location is at the corner of Penang Street (not Penang Road) and Church Street and it is open to the office crowd. There is a stall that was featured by newspapers and magazines, looking at the clippings on their greasy stall. They sell Hakka pork which tastes like the kai chai peng (chicken biscuit). The pork is crunchy and chewy. Too bad that I had a painful jaw and couldn’t enjoy much. 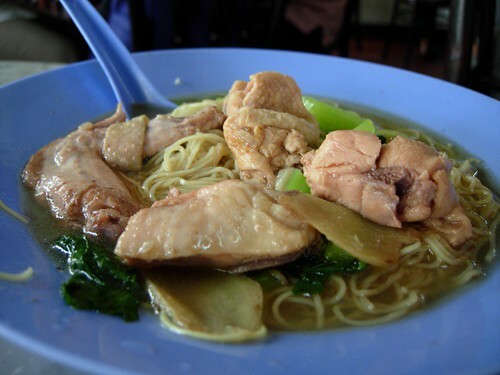 The same stall also sells various types of wantan mee and from the look of it, their wantan mee is very popular. I ordered one drunken chicken wantan mee and the portion is big with generous amounts of chicken. I can’t remember the price but I think it is RM4.50. I like going to this coffee shop for its koay teow th’ng and roti bakar as well. 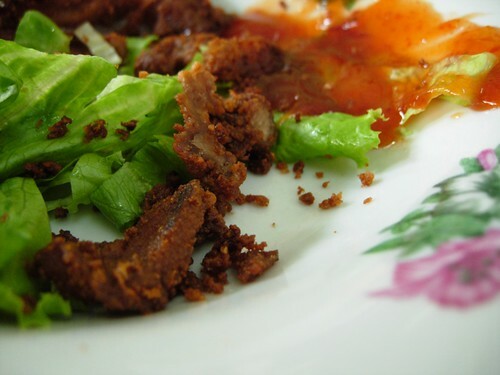 Lately, most of my hawker foods reviews are posted on Penang Foods but I will keep this blog running with pork recipes. i lurvee hakka pork! and coincidentally i am a hakka also.. hehe and drunken chicken, too bad my mom hardly cooks it.